Ashburton Grove - Arsenal news and Arsenal opinion: Szczesny's battle cry -RVP's "unbelievable" training ground skills -Wenger to sell Arshavin? 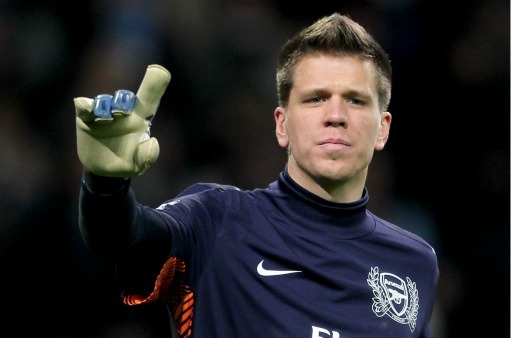 Szczesny's battle cry -RVP's "unbelievable" training ground skills -Wenger to sell Arshavin? Reflecting on Sunday's game, it's clear that not much separates the top teams right now. The only thing which Manchester City did that we didn't achieve was to do was put the ball in the back of the net (and I know that's a huge part of winning a game). There was little obvious signs that they really far more superior to us having spent millions of pound on their squad. Personally I'm not despondent about this defeat as I usually get. I saw signs from this Arsenal team that they will give their all to win. There was no giving up after the goal went in. In fact for the last 20 minutes of the game I thought we looked the more likely of the two teams to score. I think it helps that their is a different mentality to this Wenger team. Perhaps instilled in it because of the increased number of experienced heads in the dressing room. On Sunday you could see that there were some stand out performances. Mikel Arteta impressed alongside the increasingly dependable Alex Song. The two of them have provided us with a fantastic base to which we can form our attacks. In defence Laurent Koscielny is showing why Wenger spent £10m on him. He shut out Messi at the Grove last season and had Aguero under lock and key on Sunday. I think he's certainly proved many of his critics wrong. Gervinho was the focal point of many of our attacks. He's adapting well to life in the Premier League and when he's finding his feet we're just about to lose him to the Africa Cup of Nations. He's got improvements to make with his final ball and he could be more selfish in front of goal, but I think that will come. I love the way he runs at defenders and causes them to panic because he is so unpredictable - you never know what he's going to do next. Already he has provided the most assists and if he can find his shooting boots in the second half of the campaign could be vital in propelling us up the league table. Another of those stand out performers for me was Wojciech Szczesny. If the critics had had their way and Fulham had not been so greedy, we might have had Mark Schwarzer blocking the Poland international's progress into the first team. Instead it was an unfortunate injury against Sunday's opposition to Lukasz Fabianski which provided Szczesny with his chance and he's not looked back. Whilst I've been pleasantly surprised with the younger Pole's elevation to the first team and the consistently good performances he's turned in, I don't think anyone could have predicted how good Szczesny would be for both the team and the defence. I like his confidence. He's got bags of it in pretty much the same way Nicklas Bendtner has although Szczesny is backing up his cockiness with fantastic performances. Bob Wilson has always said at the end of the season a good goalkeeper would have won his team points. I think we've seen Szczesny do just that on a number of occasions already this season. And the goalkeeper has come out and stated that this team won't let the defeat at Eastland's get them down. "We've had a few good results and the confidence comes back with that. This defeat certainly won't take that belief and confidence away from us. We have Aston Villa on Wednesday and then a reasonably easy run over Christmas [Wolves, QPR and Fulham] so we feel we can get a run of results together. "I think the tough times we went through have made us stronger. We made some great signings after the poor start to the season and have got the spirit back in the team. So we feel stronger and that we can go a long way in all the competitions between now and the end of the season." The first thing we need to do is get back to winning ways and that has to start against Aston Villa tomorrow night. It's not going to be easy. They were beaten 2-0 by Liverpool on Sunday so they'll want to respond to that. Plus they've got Alex McLeish in charge and we know the kind of Birmingham teams he liked to play against us. The team news isn't that promising either. Johan Djourou had a scan yesterday the results of which aren't known publicly yet. Whilst Kieran Gibbs had an assessment at the training ground which appears to have ruled him out of a start tomorrow night. So it leaves the manager with a decision to make over who will start in his very makeshift defence. I would imagine he'll go with the four central defenders who finished Sunday's game and bring in Sebastien Squillaci as cover on the bench. The other area we need to cover is in midfield as Alex Song sits this one out through suspension. I would guess that Emmanuel Frimpong will get the nod ahead of Francis Coquelin. Despite reports that Mikel Arteta is also suspended, which isn't the case, he will play. However the Spaniard is one booking away from a one game suspension. It will be interesting to see how the manager rotates his players given we're due to play four games in 13 days over the festive period, which may be cut to 12 days if we have to delay our match with Wolves by 24 hours because of the tube strike. Elsewhere Brek Shea has been thanking the club for letting him train with them during the MLS off season. The midfielder's time at London Colney came to an end ten days ago and he's returned to the USA for the holiday period, but not before revealing he was impressed with RVP's skills. "I enjoyed my stay and can see myself living there in future. "Watching Robin van Persie practice was unbelievable and hopefully I can learn from that." By all accounts the USA international's time at Colney was good and he bonded well with several of the players. Whether Wenger has seen enough in Shea to want to sign him is yet to be seen. And finally the Daily Mirror report that Arsene Wenger is ready to listen to offers for Andrey Arshavin in January, if he can buy a replacement. They report that only Galatasaray had expressed an interest in the player last summer, so it doesn't seem likely anyone else would be prepared to come in and pay us real money for the Russian. Personally I can't see him leaving mid-season. He's got a chance to win back a place in the starting 11 next month while Gervinho is away, so I don't expect any decision to be made on his future prior to next summer. The manager would normally give a press conference today prior to tomorrow's away game. I'm not sure if there is one scheduled but I expect the official site will update us with team news later in the day.